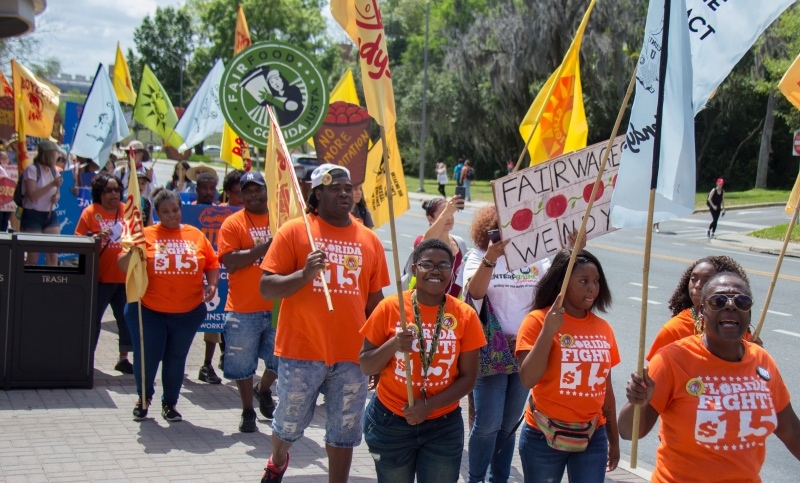 Massive march on final day of 4 for Fair Food Tour swamps “The Swamp” in Gainesville with farmworkers, students, Fair Food activists calling on UF President Kent Fuchs to “Boot the Braids” from Florida’s flagship university until Wendy’s joins the Fair Food Program! 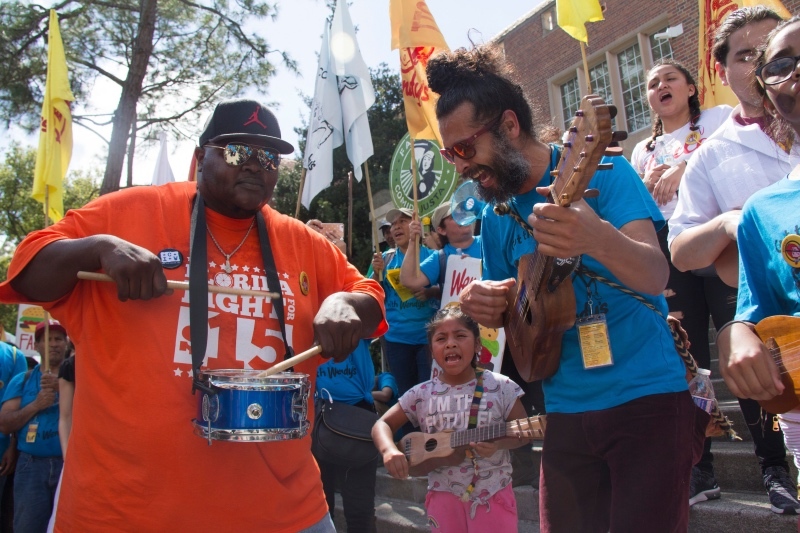 What a way to wrap up a tour! 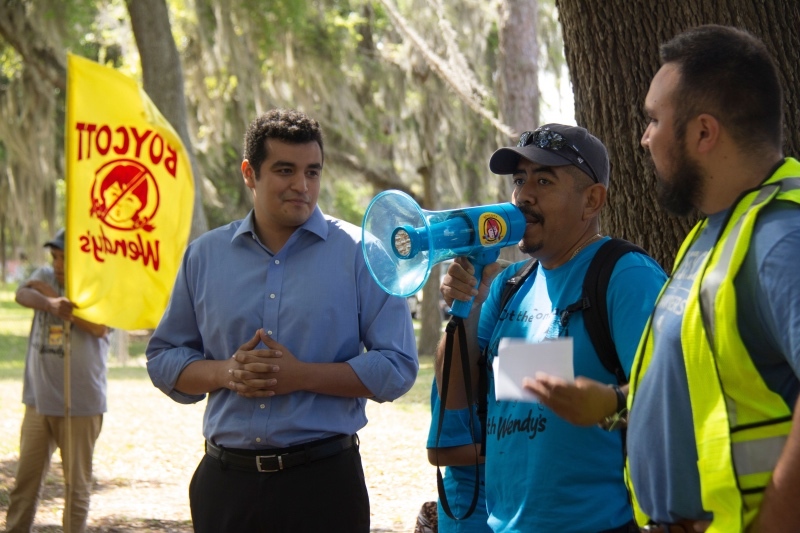 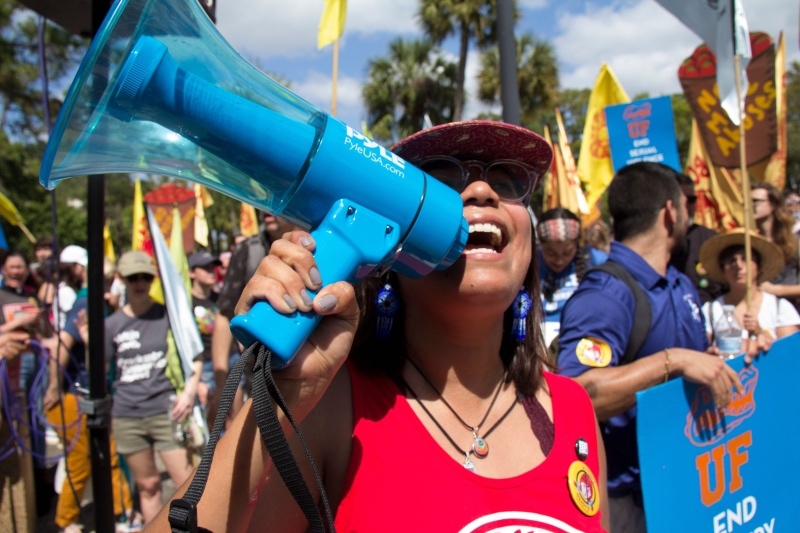 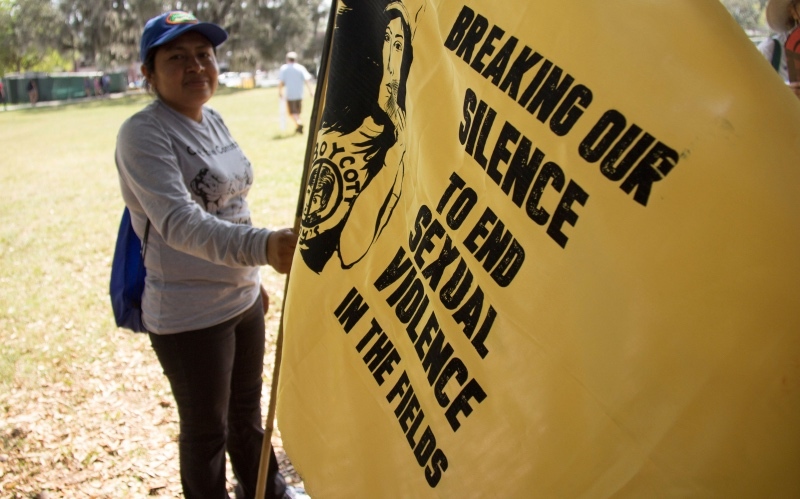 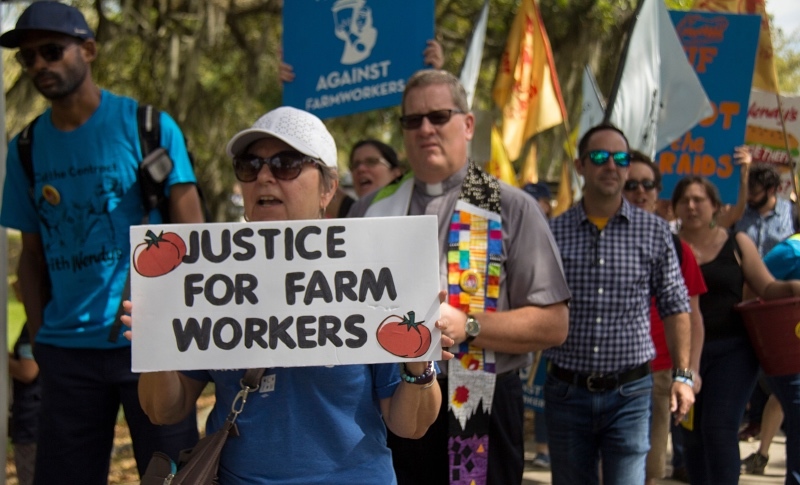 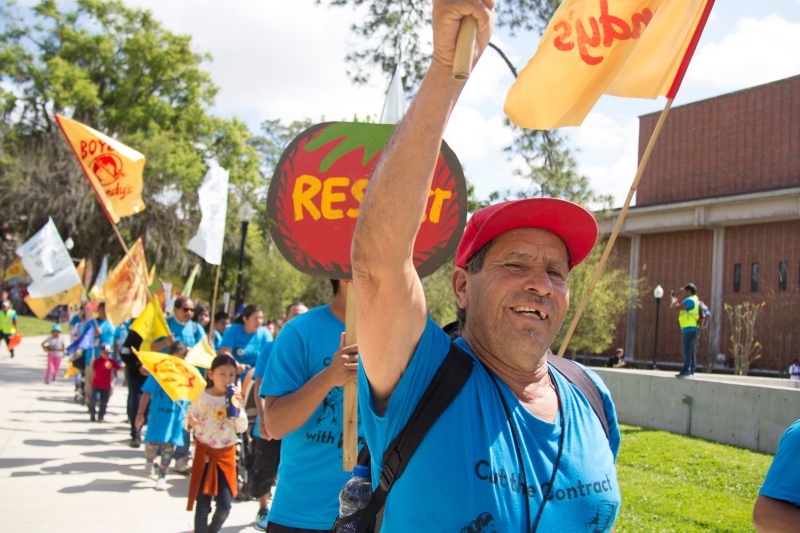 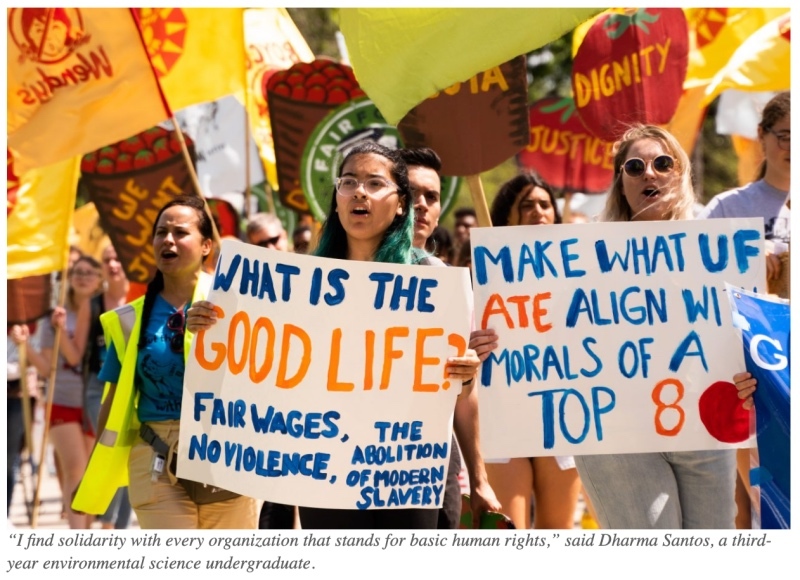 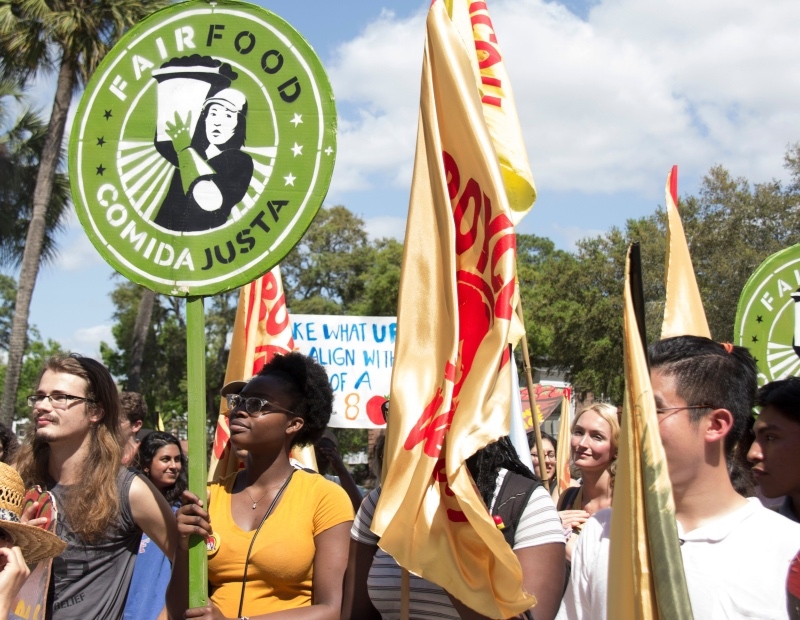 On the final day of the five-city, two-week “4 for Fair Food Tour,” nearly 500 protesters – equal parts farmworkers, students, and community members – wove as one through the University of Florida’s picturesque campus in a colorful and boisterous demonstration. 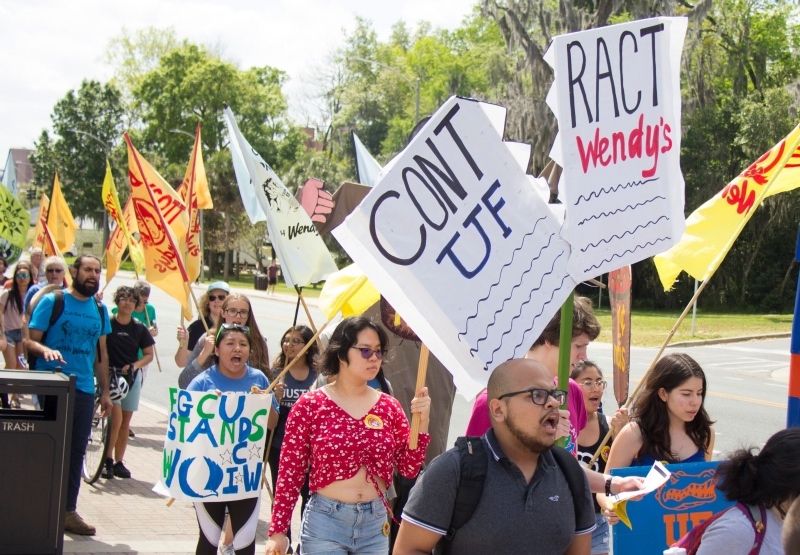 They were fed up with the UF administration’s willingness to turn a deaf ear to students’ concerns, calling on UF President Kent Fuchs to cut the university’s contract with Wendy’s, without further delay, until Wendy’s joins fast-food industry leaders McDonald’s, Burger King, Subway, Chipotle, and Taco Bell in requiring its tomato suppliers to meet the stringent human rights standards of the Presidential medal-winning Fair Food Program. 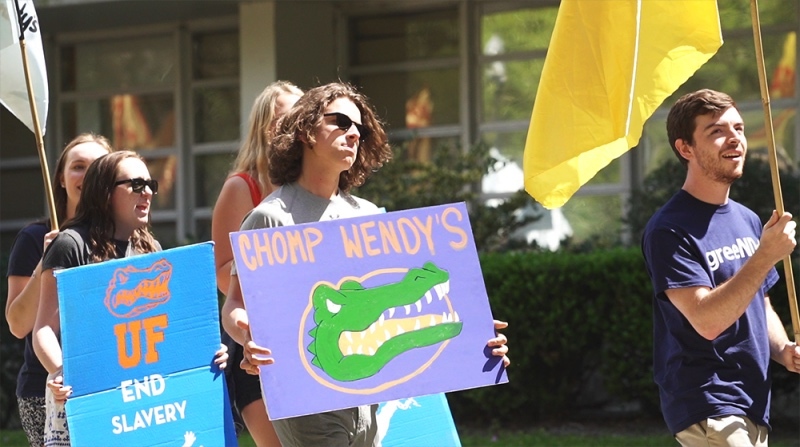 It is safe to say that the University of Florida had never seen anything quite like Thursday’s march before. 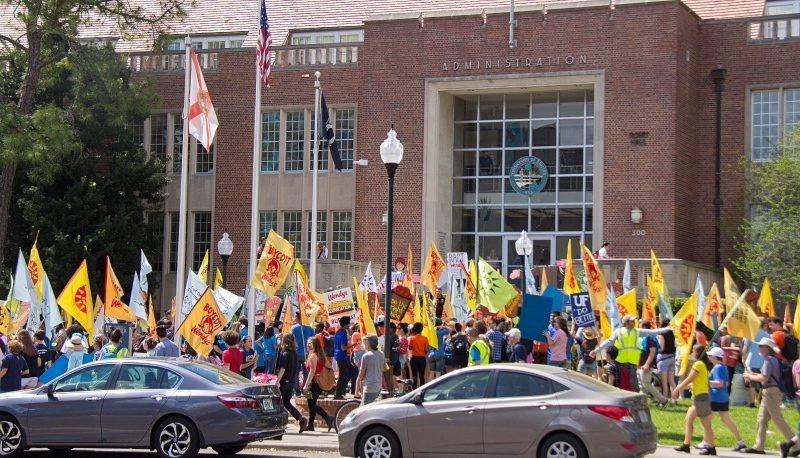 So, in addition to the above video, we have put together an extensive photo report, which follows below. 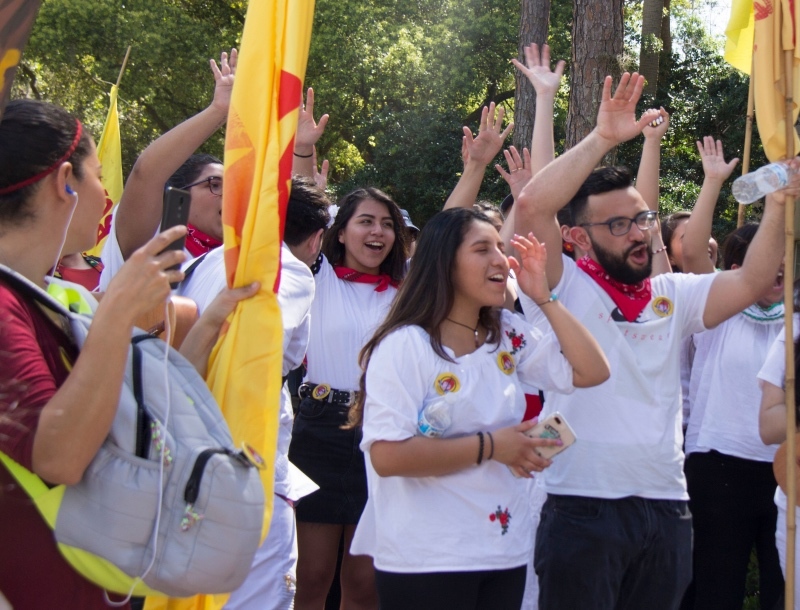 We hope you have a few minutes to pull up a chair and re-live the sights and sensations of what turned out to be a truly memorable action. 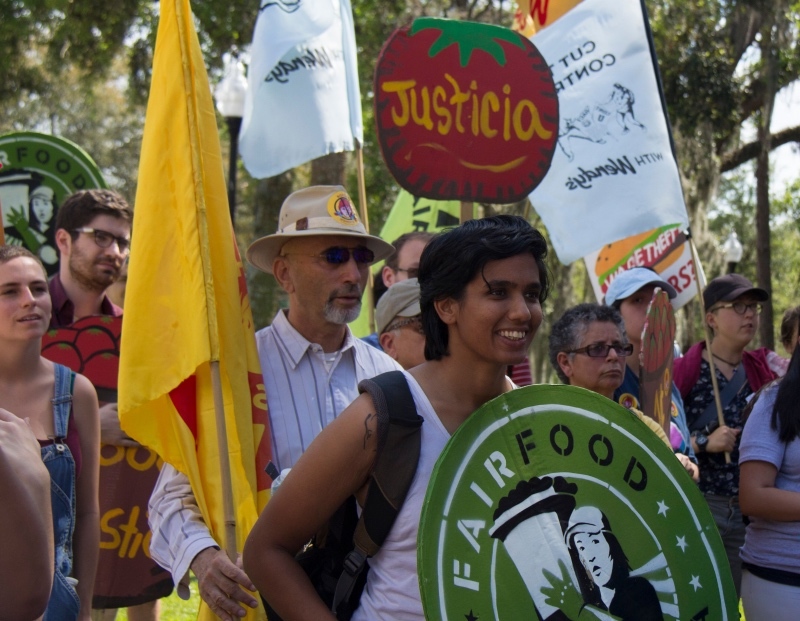 One last word before moving on the photo report… Needless to say, the CIW’s sincerest thanks go out to all the allies who worked tirelessly to organize last week’s march, and all the actions of the 4 for Fair Food Tour, from Chapel Hill, North Carolina, to Ann Arbor, Michigan. 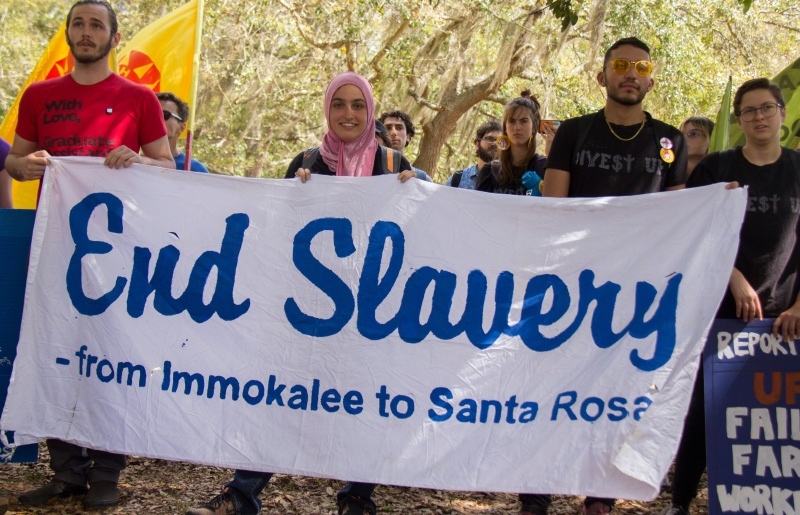 The logistics of housing, feeding, and transporting a busload of souls from Immokalee (two buses, in fact, once the tour hit Gainesville!) 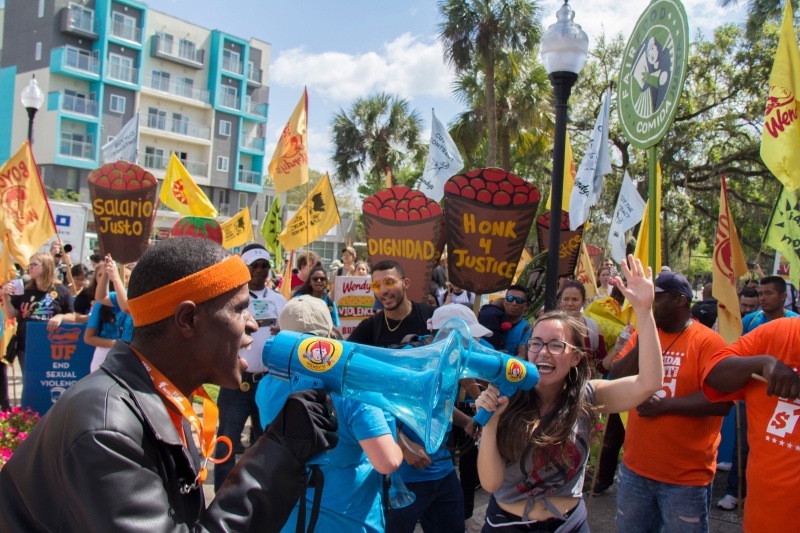 on an odyssey covering thousands of miles, from cold climes to warm, with impressive actions and presentations at every stop along the way, cannot be overestimated. 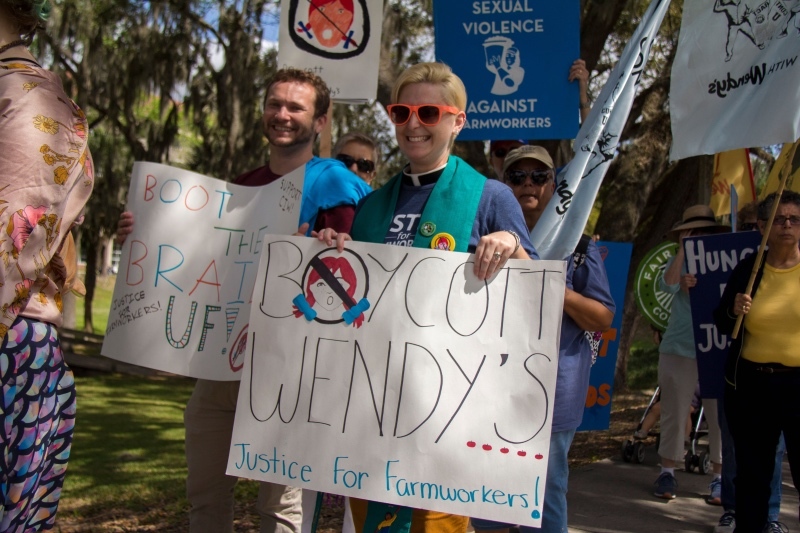 And the tour’s conclusion on Thursday in Gainesville would never have been possible without the selfless assistance of innumerable members of the vast – and fast-growing – Fair Food nation. 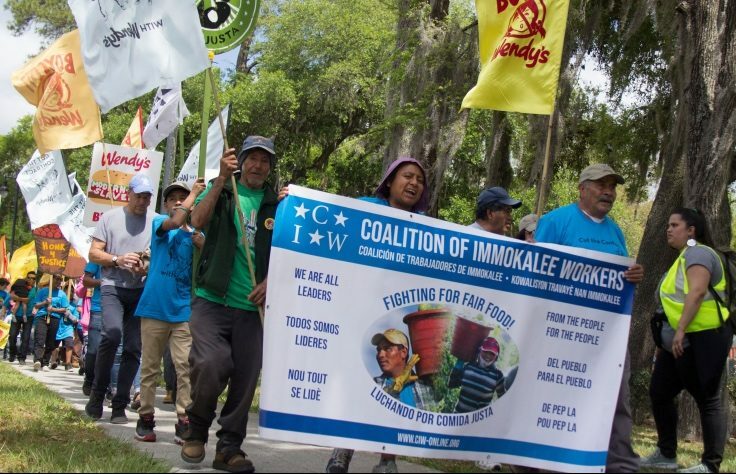 Now safely back home in Immokalee, all of us extend our deepest gratitude to all of you. 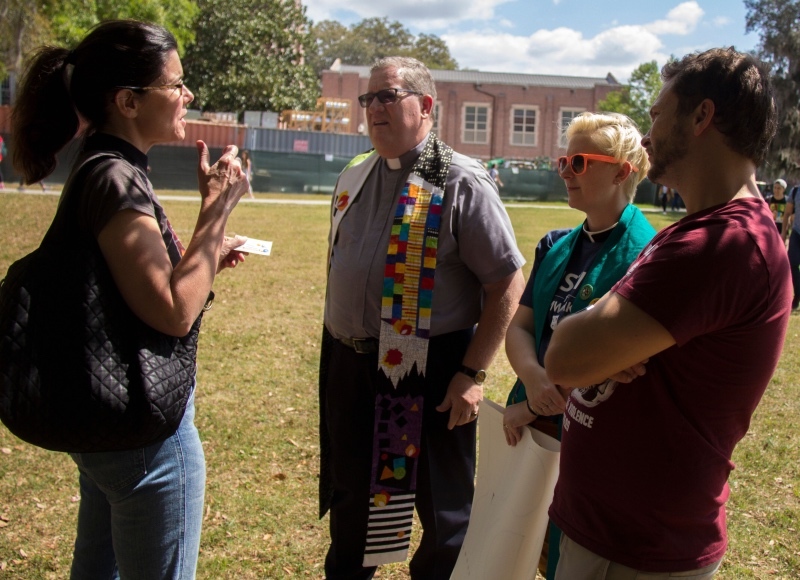 … while others, like the team of faith leaders below, huddled to go once more over plans for the march and their own messaging for the rally at the culmination of the action outside Tigert Hall, UF’s administration building. 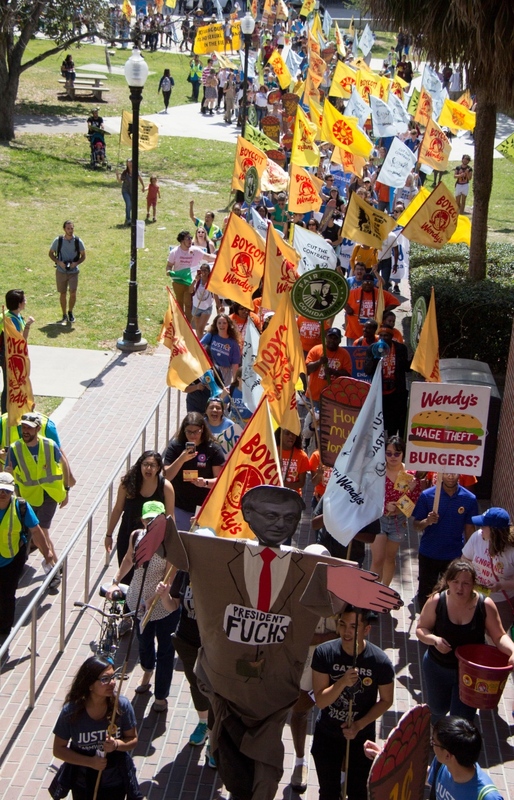 … so much, in fact, that the planned picket in front of the student union building (below, background), where a Wendy’s restaurant is housed on campus, had to be canceled, as the sheer size of the march would not allow it to fit in the space provided – a bit of news that provided no small amount of good cheer to the marchers! 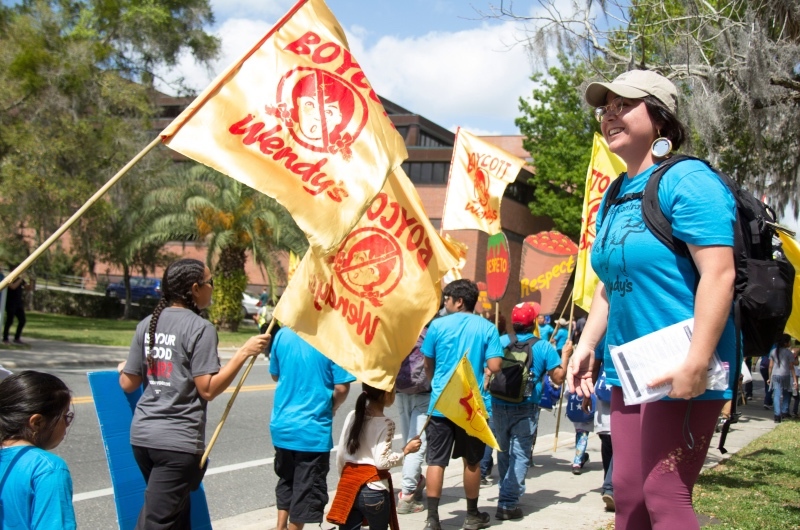 … spreading the good news, consumer by consumer, of the Fair Food Program; its unique success in ending sexual harassment and assault, violence and forced labor in the fields; and Wendy’s unconscionable refusal to join the rest of the fast-food industry in opening its tomato supply chain up to the Program’s acclaimed complaint investigation and resolution process and deep-dive audits. 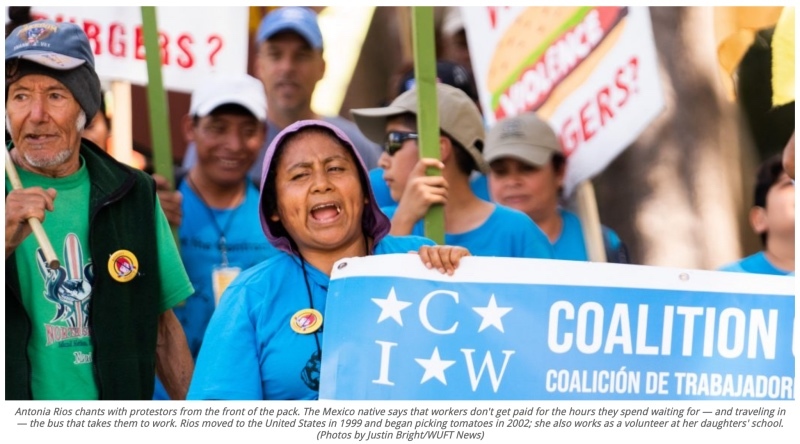 … inside the halls of power, where a crucial decision hangs in the balance. 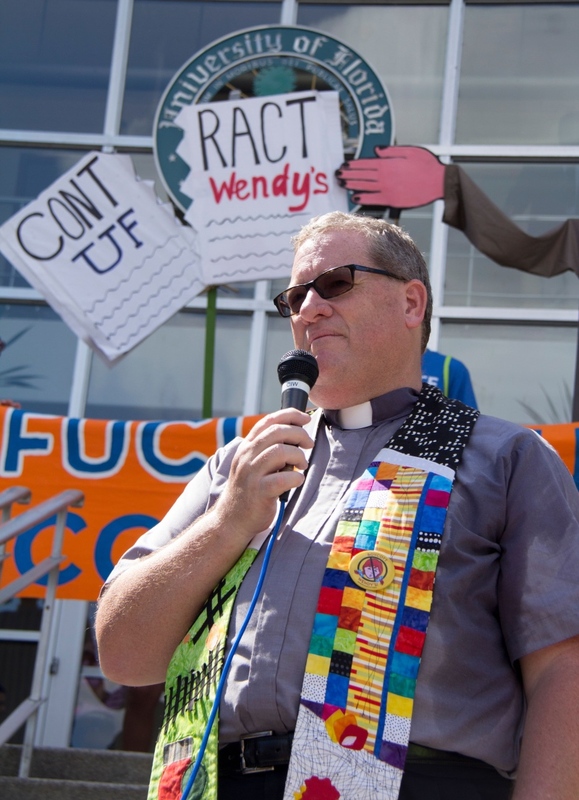 … and, representing the community of Gainesville, faith leaders (below, John Vertigan, the Conference Minister in the Florida Conference and a member of First United Church of Christ, speaks from the steps of the Tigert Hall to the marchers gathered below). 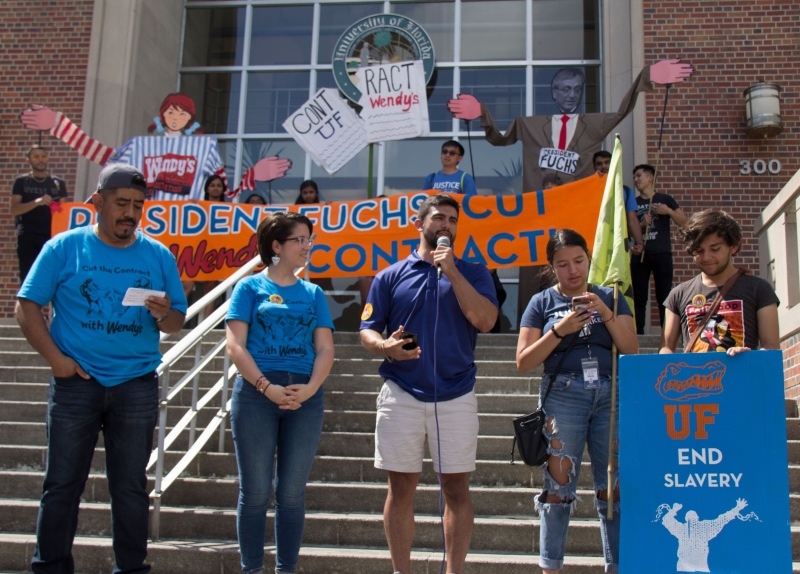 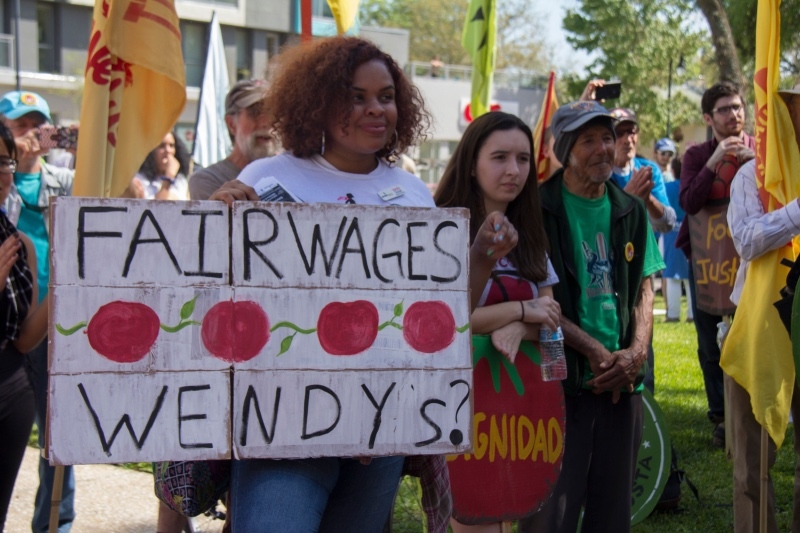 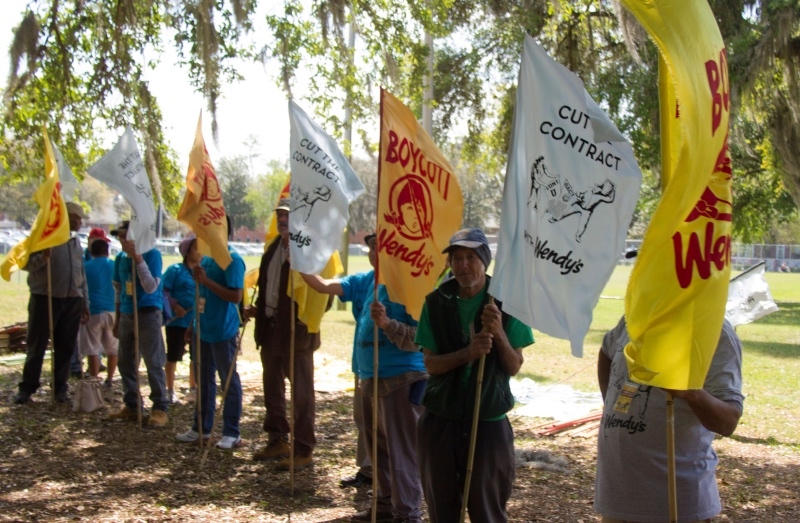 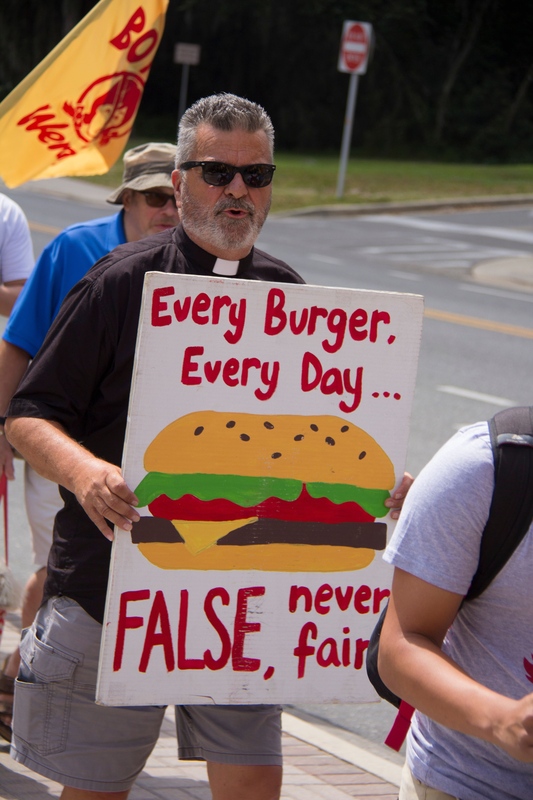 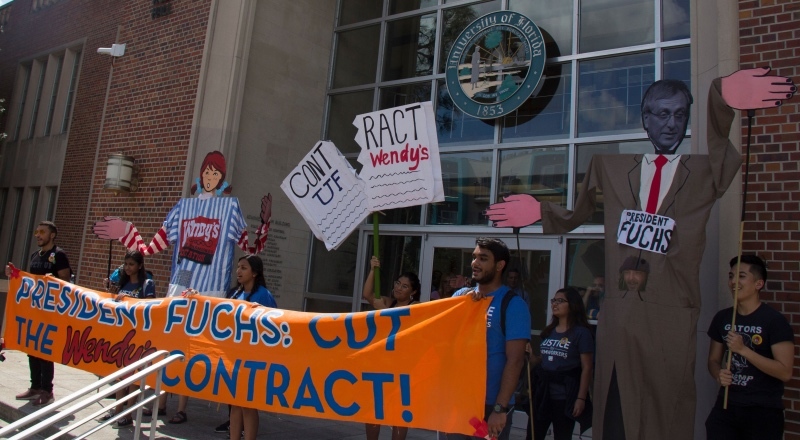 All three sectors of allies in Gainesville – students and faculty on campus, faith leaders, and other members of the community of Gainesville – vowed to continue working together, in a united front, to press President Fuchs to cut the contract with Wendy’s. 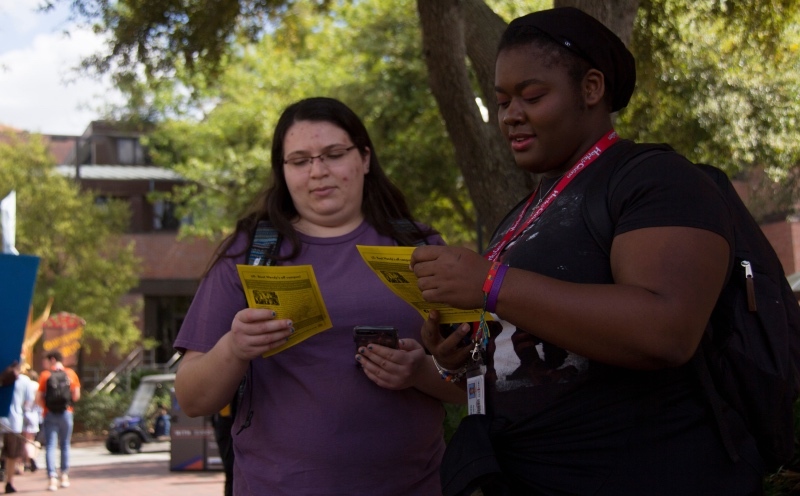 Plans are already in motion to escalate the campaign both on campus and in the city of Gainesville in the months ahead. 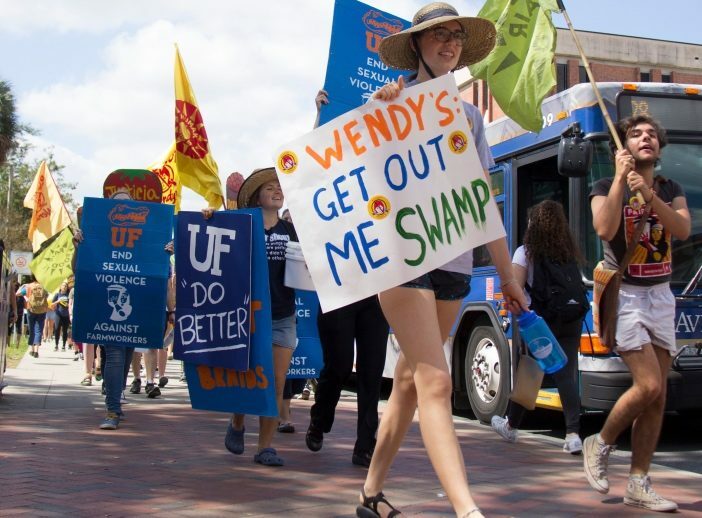 All in all, Thursday’s march at UF will surely be remembered by all who took part in it for years to come. 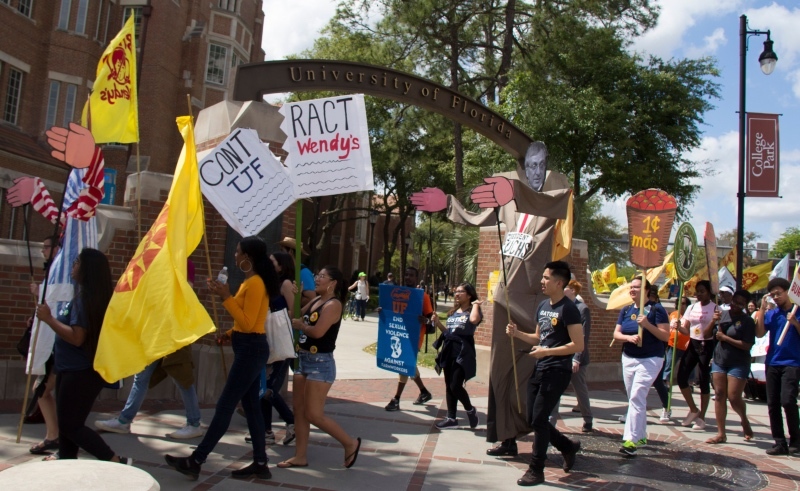 It was a major step forward not only in the campaign to Boot the Braids from the University of Florida, but in the Wendy’s Campaign more broadly. 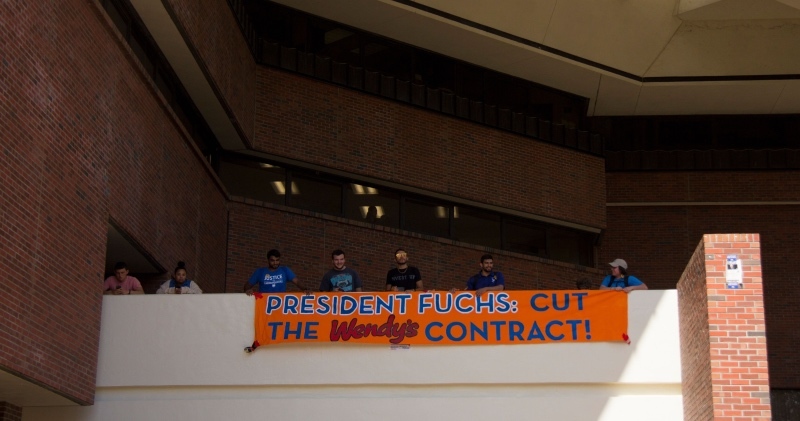 Combined with the precedent-setting victory a the University of Michigan, the march at UF proves just how powerful a carefully-organized campaign – one that reaches beyond the campus and builds bridges between students and the broader community surrounding the school – can be. 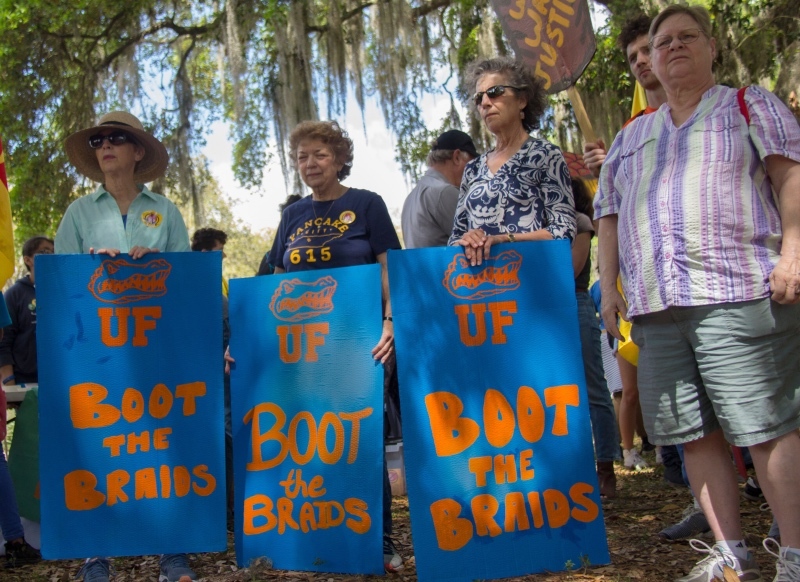 Thursday’s march not only leaves the campaign at UF stronger, it actually strengthens the campaigns on Boot the Braids campuses across the country. 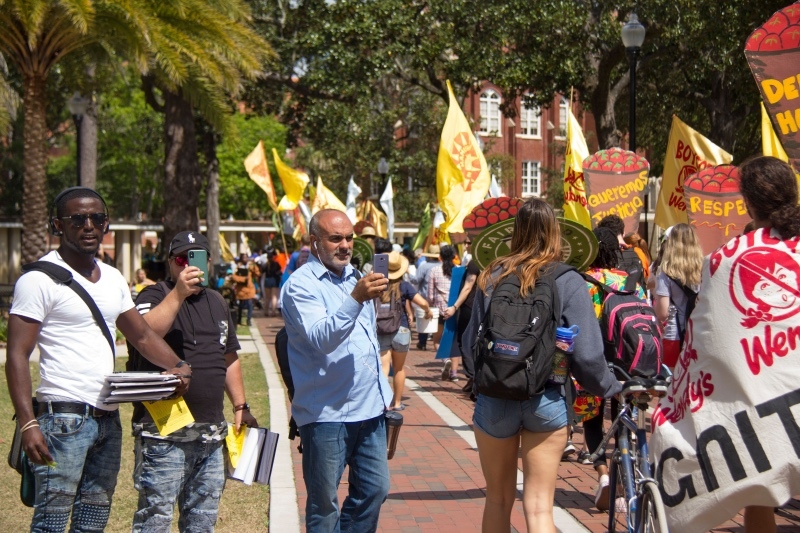 UM showed the world that victory is possible. 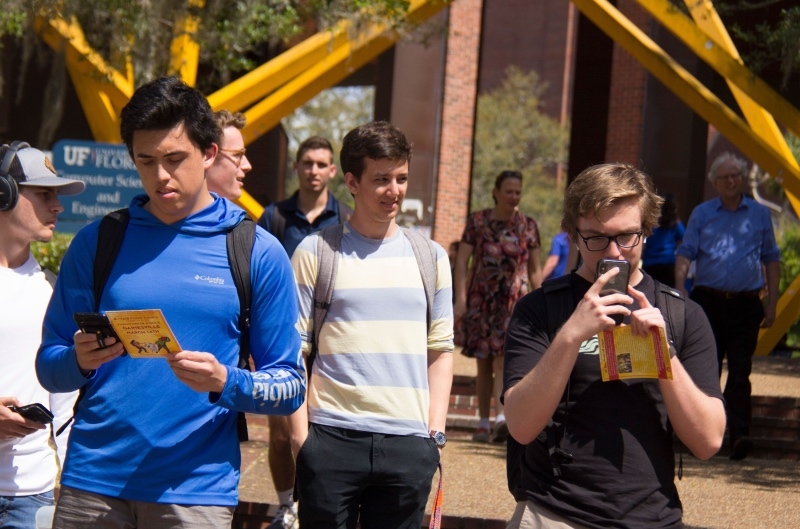 UF showed us the road to victory, and the blueprints for building it.